HBA were appointed to provide landscape consultancy as part of a multidisciplinary team for Homes for Brighton and Hove, a joint venture partnership between Brighton & Hove City Council and the Hyde Group. We have been involved with the project from concept design to submission of an outline planning application, which has included input into the pre-application process and community consultation events. The Coldean Lane site lies in the urban fringe of Brighton, in close proximity to the busy A27 and the South Downs National Park and spanning the northern slopes of the wooded coombe within which Coldean is set. The underlying landscape design concept is to integrate the proposals into the existing landscape whilst protecting the chalk grassland habitat, the landscape setting and visual amenity, and wherever possible enhancing the local landscape quality and character. The design scheme seeks to work with the steeply sloping landform with proposed buildings laid out as six pavilions in the landscape, arranged on two levels and placed in an alternate configuration to work with the natural contours as far as possible and create intersecting green spaces with a hierarchy of spaces and access routes. 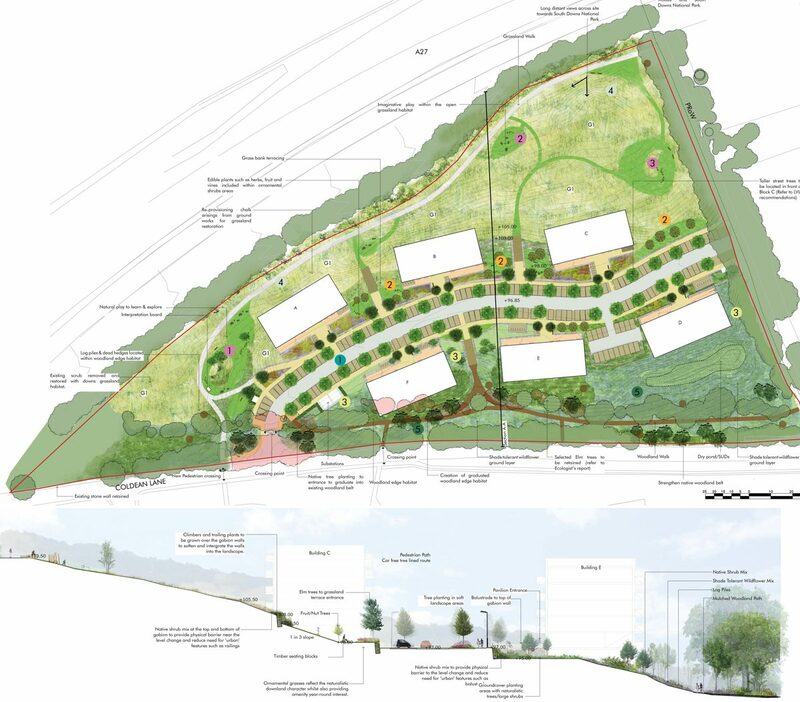 An integrated landscape and ecology strategy was developed for the site, aimed at supporting biodiversity through increasing native species and enhancing and protecting habitats. Biodiversity aims are carefully balanced with the provision of open space that also facilitates opportunities for active living and physical activity for all ages and abilities, as well as quieter areas for contemplation and joyful but safe play areas, all with natural surveillance from dwellings.